Ready, Steady, Go was started in 1995 and has continued to grow year after year, offering a warm, secure, stimulating and loving environment for little people, enabling them to grow in self esteem, as well as socially, physically, intellectually, emotionally and spiritually through enhanced work and play. Debbie Bold is the owner of Ready, Steady, Go Play Group and Montessori Pre-School. She has continued to study and complete courses that have enabled her to gain a further understanding of childcare, child development and the importance of early education which promotes holistic growth in all children. Please click on "Our school" to read all about Debbie’s training and experience, as well as what her school has to offer. 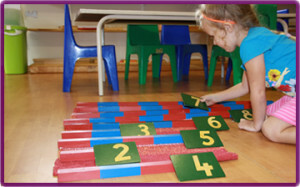 Ready, Steady, Go combines both the Montessori and Traditional teaching methods, which enables the child to develop and grow at their own pace, growing holistically and allowing them to become self disciplined and independent, in a loving, caring and fun filled environment. There is more structure available to the children in the older group but more of a fun filled environment in the younger group where the little ones learn in an informal manner through songs and games.